LG supports a number of Over-the-Top (OTT) or Internet-based applications on its commercial Pro:Centric® Smart TV Platform (HTML/webOS). These are made available to LG’s customers (hotel properties) via its System Integrator (SI) partners who are responsible for delivering and supporting the end solution containing these applications to their hotelier customers. The business terms for using these applications varies by content provider and type of service offered – some are free to use, others require guest or property subscriptions. Hotelier customers and SI partners should review the applications and the basic license requirements when choosing which applications they would like to offer the guest and the necessary business/licensing terms. We’ve provided a brochure link at the end of this post for a deeper dive. The following applications are supported on the LG Pro:Centric Smart Platform. Note that not all apps are available on every model, but as a rule of thumb, all television models support the same apps if they are the same version of webOS. There are two types of applications available on LG’s platform – either embedded apps or web apps. 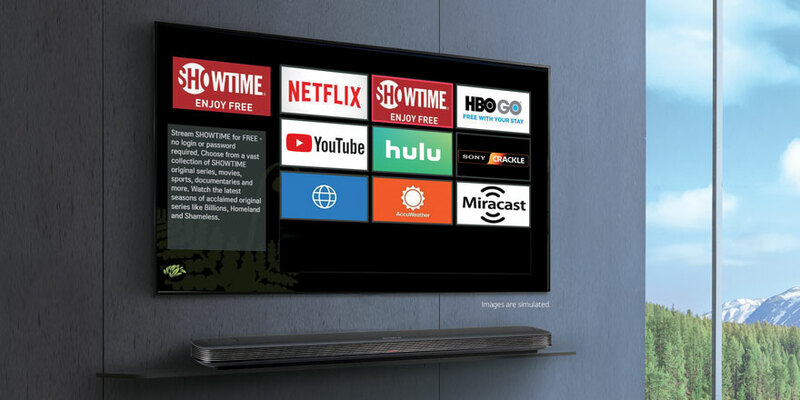 Embedded apps are what ships with the TV/STB and the app is developed by LG and the CP to reside on the TV and be launched via a third-party SI Partner Entertainment System App. Web apps reside in the cloud or Internet, and the TV launches a browser to a predefined URL with associated security credentials to access the service. OTT apps can be accessed and launched by a guest within LG’s Pro:Centric Application GUI assuming the server is licensed and configured correctly. Also, third-party SI Partner apps can launch the embedded apps via a menu placement within their user interface, which initiates the launch via the Pro:Centric hcap API (Application Program Interface). The SI can select which apps are enabled or not (on behalf of the hotelier) via the Pro:Centric Admin Client or API. If an app requires entering of personal credentials of a guest’s account (e.g. Hulu, Netflix) the TV will erase them at power-off along with any browser history. Alternatively, where an SI has a Property Management System (PMS) interface, this can be overridden and a check in/out event can be used to clear the credentials – meaning the TV will retain the guest’s credentials during the period of their stay. LG always recommends an SI is used by the hotel to manage the deployment, presentation and support of OTT apps as they have the resources and technical skill to address issues such as network bandwidth provisioning, PMS interfacing, IP networking, television programming, application management and support. In addition, they will have the necessary business terms or license agreements in place with LG. All of the applications supported on LG’s platform are licensed and certified for use in a commercial hospitality environment, e.g. in a hotel room and operating on either an LG Smart TV or STB Pro:Centric platform. Download our brochure to review app descriptions and basic license requirements per app for hotelier customers and SI partners. The Red Dot program is one of the longest-running, most respected industry competitions of its kind in the world, with more than 5,500 submissions from 55 countries entering this year’s contest. LG Electronics was again recognized for its strength in consumer and industrial design, earning 29 product design accolades at this year’s running of the Red Dot Award. LG’s impressive collection includes two Best of the Best honors for its LG SIGNATURE OLED TV R and LG SIGNATURE bottom-freezer refrigerator. As the world’s first and only “rollable” TV, the LG SIGNATURE OLED TV R delivers the unmatched image quality of LG OLED in a small package, with the magical ability to disappear into a low-profile base when not in use. Named Best TV Product of CES 2019 and hailed by many industry experts as a new paradigm in television, the Best of the Best recognition from Red Dot is confirmation of LG’s innovation leadership. Read the whole LG Red Dot awards story here. Have a look at the LG SIGNATURE OLED Rollable TV in action. Over the past few weeks we’ve been telling you about commercial display solutions for bank and financial service company lobbies, customer-facing workstations and technology to enhance data security. The same technology you use for the front of house applications can also be used for the back of house, i.e., training, corporate communications, live IP streams, videoconferencing, town hall type meetings, messages from the top, etc. And it can all work seamlessly with LG displays. For conference rooms and huddle rooms, large format 4K UHD displays are the ideal solution thanks to the outstanding image quality and future-proofing they provide. LG 4K UHD displays feature auto detect functions that sense when a notebook is plugged in, a standby screen that can be branded with your company’s logo, plus full compatibility with industry-leading meeting room control platforms. The larger the room, the greater the need for a larger display. LG’s 98-inch 4K UHD display is the largest LG single display that can be purchased for a conference room instead of using high-maintenance projection. Companies looking for something even bigger can opt for a video wall or a massive indoor DVLED with fine pixel pitch. Automate the conference room. LG provides a host of commercial displays that are Cisco Certified and Crestron Connected® for seamless integration, automated videoconferencing and meeting room control. These displays eliminate the significant expense and time required to set up a display at the systems integrator level. 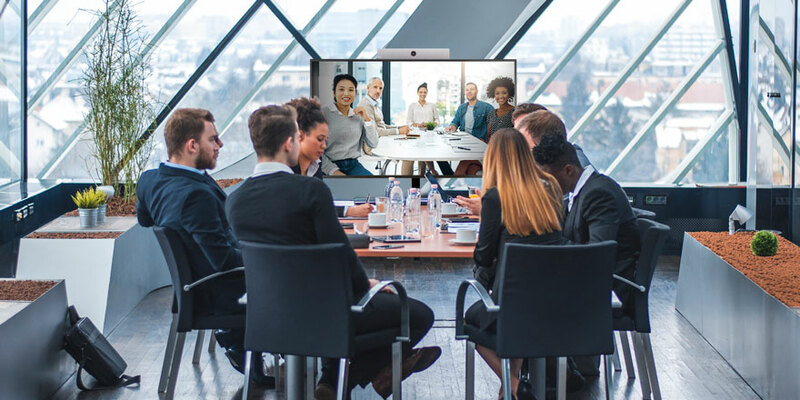 LG’s plug-and-play solution for the Cisco Spark Room Kit and Spark Room Kit Plus is currently being used to standardize videoconferencing throughout worldwide branches and offices of major financial services organizations, and backed by global support from both LG and Cisco. Both room kits offer sophisticated camera technologies that bring speaker-tracking capabilities to every room. Imagine commanding the conference room even before you start speaking. Crestron automation and control solutions let people control entire environments. Utilizing a Crestron Airmedia unit, a presenter can enter the meeting room, connect to the Airmedia device via wireless Ethernet and turn on the LG display, dim the room lights and close the blinds with a simple push of a button. Quite an impressive way to start the show. Conclusion. Whether a bank or financial services company is highly experienced in the digital marketplace or just beginning, LG has the answers to help you visualize your solution and implement it successfully. Since our commercial display products cover front of house to back of house applications, it is often possible to spread out costs between different departments – corporate communications might pick up the cost for training; marketing & branding might take the cost for front of house. With various intended uses, not any one cost center would need to bear the entire load. This is great news for end users and resellers alike, as LG offers end-to-end solutions, deployment and management support that can help reinvent brick-and-mortar customer experiences to be more welcoming, more accommodating and more valuable. Nothing is more sensitive than money. Maximizing performance while keeping technology secure is critical for your financial institution’s integrity and your clients’ financial welfare. Thin Clients provide a secure, reliable, and cost-efficient virtual desktop experience that’s easy to implement and manage. When they’re deployed in financial settings such as banks and wealth management firms, Thin Clients can provide additional benefits. Keep objectives in sight. Keeping tabs on financial matters requires unwavering attention to constantly changing data. Thin Clients support continuous multitasking with scalable, multimonitor support up to 4K resolution. And for complex financial transactions and modeling, IT administrators can create powerful virtual machines (VMs) within the data center and allow analysts to access them through their Thin Clients. Secure client and personal financial data. Thin Clients never store valuable and sensitive information. Instead, that information remains safe at the data center and is only accessible by authorized users, bringing peace of mind to your office and the clients who depend on you. Deliver stable, reliable performance. Seconds can make all the difference in the high-stakes world of investing. Trading clunky and demanding PCs for streamlined Thin Clients lets the office do more with less IT red tape, eliminating potential downtime due to constant updates or maintenance. Optimize productivity and compliance. Compared to traditional PCs, Thin Clients simplify management and compliance. IT administrators can update software and implement rule changes from a single management console—for instance, making software security updates at the data center and limiting the use of USB drives across the Thin Client fleet. The relative simplicity of the process can improve overall compliance and free administrators to focus on other tasks. 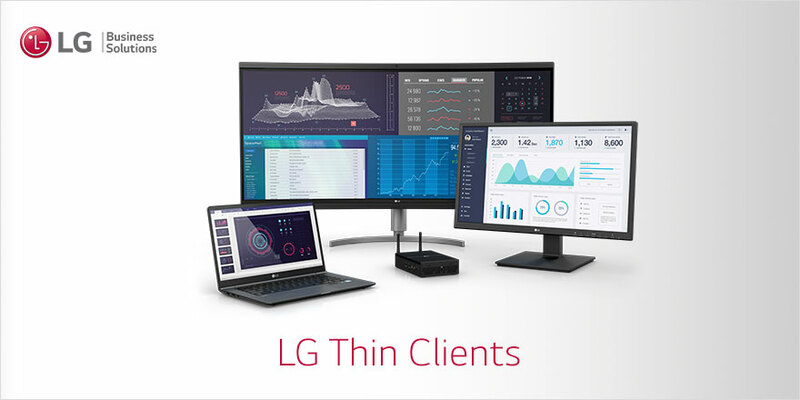 From UltraWide® all-in-one desktop displays to ultra-lightweight laptops, LG offers a full range of Thin Client endpoints that provide a reliable and cost-effective virtual desktop experience ideal for financial institutions. Next week we’ll conclude this series with a look inside the conference room, and how you can command the room even before you start speaking. *Simulation data based on a virtual work site with 1,000 employees. 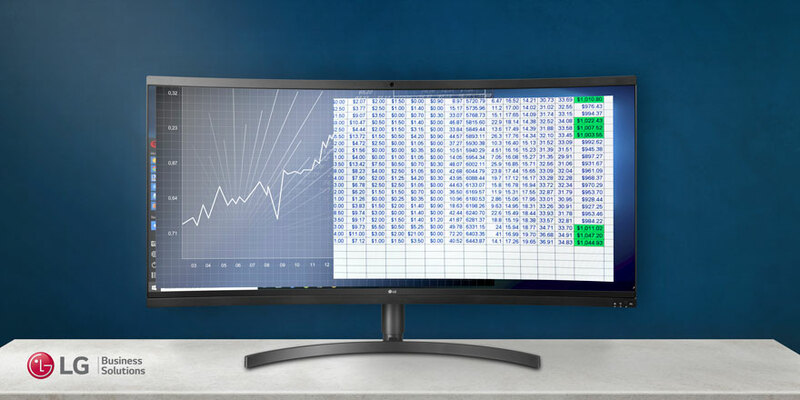 Finance companies today are moving from a dual/multiple monitor workspace environment to a single high-resolution ultra-wide display form factor. This creates a more seamless environment with fewer connectivity issues, reduces overall cost and looks great on the desk. Ultra-efficient and ultra-detailed UltraWide® monitors present an easy and cost-effective approach to reducing clutter and improving efficiency. With a 21:9 aspect ratio and 34-inch, 38-inch and new 49-inch screen sizes, users can comfortably view multiple documents or applications simultaneously. For consumer banks. The curved UltraWide monitors portray a classy, modern image to bank customers as opposed to the old-school clunky monitors of yesterday. Today’s customers are much more sophisticated when it comes to media and banks want to project a more professional image to their customers through the bank’s workstations. Trading floors have expanded needs. It’s not uncommon to see six monitors on articulating arms being used. Stock traders must generate instant profit based on information from numerous sources that is ever-changing. Therefore, a highly immersive display is required in order to promote high concentration while enabling multitasking. Stacking two 38-inch UltraWide monitors, one on top of the other, will provide eight inputs on two displays and can result in less workspace fatigue while creating a finer degree of ambience with clean lines and an unobstructed view. UltraWide at a glance. In addition to the 21:9 aspect ratio (2.4 times wider than the standard 16:9), an UltraWide has an ultra-wide angle of view. LG’s In-Plane Switching (IPS) technology provides a true 178-degree wide viewing angle where color and contrast remain consistent and data is legible. It’s a clear and comfortable advantage when reviewing accounts, charts and numbers with the customer. Other features include a 4-Screen Split feature that divides the screen into four customizable segments for easy multitasking, four inputs on select models, plus Reader Mode and Flicker-Safe to lessen eye fatigue and minimize eyestrain. UltraWide monitors are available in WQHD (3840×1600), QHD (3440×1440), and FHD (1920×1080) resolution. Next time we’ll get into creating a high security environment for sensitive data using a Virtual Desktop Infrastructure (VDI) with Thin Client endpoints. Check back on Friday. Banking and financial service customers today have enhanced information at their fingertips via the Internet, and expect a connected business that instantly responds to their needs. And customers familiar with the digital landscape have high expectations regarding differentiated services. As a result, customer preferences for online/mobile platform services are rising while face-to-face interactions are decreasing. But customers still want to engage with a personal banker when dealing with serious financial decisions, opening new accounts and making major transactions. Starting with a warm, digital welcome. With strategic use of digital signage in the front of house, finance companies can keep their customers engaged, informed and even entertained. 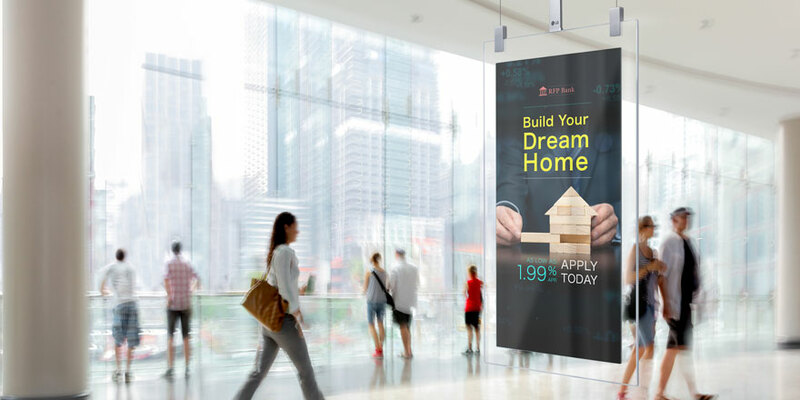 Digital signage enhances the customer’s experience in several ways: It could be by providing way-finding directions, product and service information, the latest company news, or infotainment to reduce stress for customers waiting in line to do a financial transaction or speak with a representative. There’s never a shortage of relevant, current content for a finance company and digital content can be created and managed remotely, even across branches, or down to individual displays. Finance companies are using digital signage creatively too. Some use large format displays or video walls to show compelling content while their customers relax in coffee-lounge areas staffed with baristas. Others are offering displays in specified areas for their business customers to use for client presentations. Still others use dual-sided displays near the front window, with content facing out to attract passersby and content facing in to engage customers further. It’s all to drive the value of the in-person experience. Engage customers with a personalized experience. Commercial displays with embedded Beacon and Bluetooth® Low Energy (BLE) technology can enable individualized messaging to customers that have the business’s app on their smartphones – the most effective types of messaging make the customer’s immediate experiences easier and richer. In addition, displays equipped with touch screen technology can enable interactive way-finding and invite customers to learn more about the products, services or company. Spectacular displays make a grand impression. Standard functional displays are used as digital signage, digital posters and interactive screens. But there is also a competitiveness between banks and financial services companies concerned about the image they are projecting to customers. LG OLED, Ultra Stretch and Direct View LED displays offer a key advantage in creating a statement of prestige, client-focused strategy and savvy marketing. Next week we’ll get into how finance companies are revamping their appearance by reducing desktop clutter and improving workspace efficiency. Stay tuned. Melissa Lallas | LG Electronics USA, Inc. In working with Senior Living communities, it is important that we (As sales reps, resellers and system integrators) talk the talk specific to the industry. Generally speaking, the decision-makers and influencers are not IT technicians immersed every day in specs and network operations. Rather, they are more straightforward in wanting to know what a solution’s immediate benefits are for both the residents and the facilities. And when it comes to resident and facility televisions, they’re accustomed to a BYOD environment or going to the local big box store to buy the least expensive TVs they can find. The term “Long Term Care” has become obsolete. Today it is all about “Senior Living,” Active Aging,” or “Aging in Place.” Most recently, the focus is on Resident Engagement. But what does that mean, exactly? Resident engagement means keeping everyone aware of and involved in the community activities. So, if we simply use the term “Pro:Centric,” that doesn’t resonate with the administrators – they’ll look at us like we are talking about something super technical and non-relatable. However, when we reword our message and say LG’s commercial-grade TVs operate on one platform that saves time and money, coupled with the fact that some models feature a resident engagement solution, NOW we’ve got their attention. The Resident Engagement Solution, powered by the LG Pro:Centric platform already built into most LG commercial TVs and LG set top box, will allow for a subscription-free means of communicating all activities, food menus, local area maps, community map, weather and more; and can even enable resident-interactive offerings such as booking salon services and other appointments, and signing up for activities, all from the LG TV. And this will also save time and money for the maintenance, IT and admin team. How? One platform, no longer the need to print paper signs or flyers, no longer the need for room visits to program TVs, no longer the need to figure out multiple brands of resident’s TVs; and all changes, updates and communications are made centrally via the LG Pro:Centric server. To top it off, LG works with a nationwide network of certified resellers and system integrators to pull this all together based on the Senior Living community’s specific needs, not to mention LG’s Five-Star Service program to keep everything running smoothly when and if the need arises. With the Resident Engagement Solution powered by Pro:Centric, there’s nothing old about Senior Living anymore. Every big shift is sparked by a breakthrough technology – and powering the new virtual workspace is PCoIP® technology. Pronounced “PC-Over-IP”, this invention by Teradici is what truly defines the “zero” in an LG zero client because it enables users to work without any data stored on endpoint hardware. PCoIP technology does amazing things behind-the-scenes without you knowing it. It secures data by transferring only image information in the form of pixels to displays – so business information never leaves the cloud or data center. From a user’s perspective, the computing experience is no different than working with a local computer loaded with software. We won’t dive further into how the technology works (as we have a whole website for that – Teradici.com), but for those unfamiliar with PCoIP technology, you now have an understanding of why LG provides PCoIP Zero Clients to its customers. So… let’s get to the perks. What is LG offering? 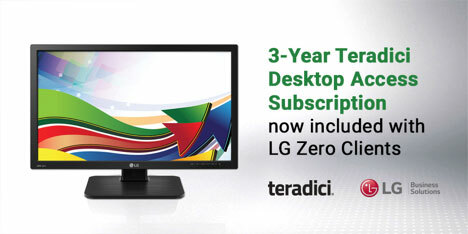 LG is offering a complimentary 3-year subscription to the Teradici Desktop Access plan for every qualifying PCoIP Zero Client. Purchases of LG Zero Clients made on or after December 1, 2018 qualify for this offer with proof of purchase– so keep your receipts. What is Teradici Desktop Access? Desktop Access includes the Teradici PCoIP Management Console which is a centralized software tool that provisions, monitors, and scales PCoIP Zero Client deployments. Lastly, if you have ever considered transitioning applications and data to the cloud, this subscription plan includes 3 trial licenses of Teradici Cloud Access Software. It enables secure, remote access to applications and data stored in a public, private, or hybrid environment with the security and performance PCoIP technology delivers. How do you redeem your complimentary 3-year subscription? Register your LG zero client purchase at connect.teradici.com/lge-registration. Looking to purchase LG zero clients? The LG trade-up and recycling program may be of interest. Migrate to the latest PCoIP Zero Clients from LG and fully leverage the benefits of your virtualization strategy. You’ll increase security, and reduce power consumption and maintenance. See if you are eligible for a trade-in rebate and learn more about the full client offering from LG at www.lg.com/us. More than 850 Snap Fitness locations throughout the United States will soon be adding LG commercial displays to their wide range of fitness equipment. 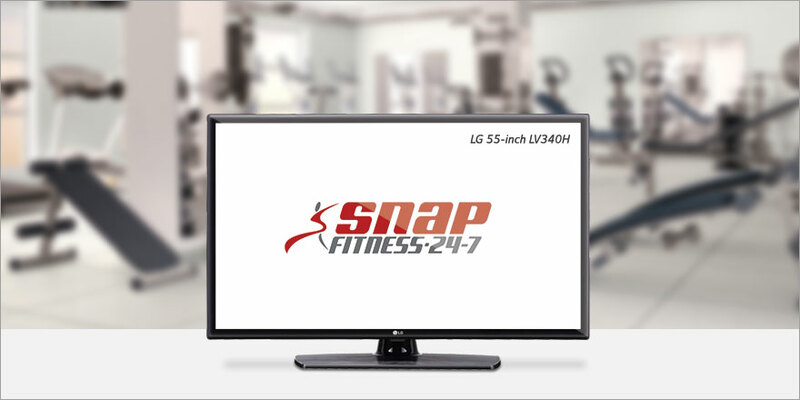 Snap Fitness, one of the world’s largest fitness operators with 1,400-plus facilities globally, just awarded LG “Preferred Vendor” status and will offer LG 55-inch FHD LV340H and 65-inch 4K/UHD UU340C TVs to their franchisees. These cost-effective, commercial-grade TVs feature stunning picture quality, simplified interfaces and business-friendly functions such as easy channel editing and fast cloning, making them ideal for the fitness environment. Additionally, LG’s Five-Star Service program will help ensure maximum uptime. LG’s IPS (In-Plane Switching) screen technology provides a 178-degree wide angle of view where colors, contrast and clarity remain true – a key advantage as members are often watching the screens from off-axis viewpoints. Should a problem occur, the TV stores diagnostic data, which can be saved to a USB memory device, thus enabling service engineers to analyze the data and identify technical issues quickly and easily. Snap Fitness will also use select LG displays to showcase the Myzone technology, which monitors members’ heart rate to give instant feedback about how many calories they are burning and how hard they are working out. With video walls, large 4K displays, commercial TVs, sound bars and desktop monitors, LG fitness solutions offer an immersive and engaging facility experience that seamlessly incorporates third-party content – perfect for large and small ﬁtness facilities, multifamily living, hospitality properties, and in corporate environments. It’s a creation of Q1 Design, the industry leaders in digital sales and marketing solutions for residential property project marketing; and Userful™, a leading provider of video communication solutions. The install is located at a landmark riverfront location on Queen St. in Brisbane City by one of Australia’s most awarded and trusted national developers responsible for some of Australia’s most recognizable high-end property developments. The 10K video wall system, utilizing LG displays with 0.9mm bezels, is used in the Experience Center on a daily basis to showcase the landmark development and ultimately help sell property within the building. The video wall is so impressive that it draws people from the street into the center. In the Experience Center sales agents and customers interact less than three feet away from the video wall, which is why an extremely high level of resolution was key in making the experience both impressive and immersive. Q1 Design’s video walls webpage states, “4K video wall? That’s old news. 8K video wall? Not innovative enough for us at Q1 Design. It is not often these days that you see technology that is so amazing it blows you away. The video wall is powered by a 10K Userful software API solution. The software allows content to be displayed from any source, anywhere on display walls of 100+ screens using just one PC/Server. Users can control the video wall and interact with it from a desktop, phone or tablet. To make the most of this powerful communication solution, Q1 Design developed a mobile app to allow dynamic interactive control of content using a touch screen iPad. With it, users can switch between floor level units, floor plans, views and features, with 3D walkthroughs, fly throughs and more. And feel like they’re right there. Check out the Q1 Design project page here.